Rather than a wireless Bluetooth controller, the $99.95 Gamevice connects directly to the Lightning port on Apple's latest iPhones. The Gamevice is also compatible with both 4.7- and 5.5-inch iPhone sizes in one model, and it is an Apple-certified Made for iPhone accessory. When it's not in use, the Gamevice also boasts a unique, collapsible design that makes it travel-friendly. It also includes an integrated lithium-polymer 400mAh battery with a four-LED indicator. The Gamevice features the standard assortment of buttons expected from a modern gaming controller: On its face are two joysticks, a D-pad, four buttons (A, B, X and Y), as well as a pause button. Up top, it also has two trigger buttons (R2 and L2) and two bumpers (R1 and L1). The integrated Lightning jack also allows for pass-through audio to a dedicated 3.5-millimeter headphone jack. The Gamevice itself is recharged through a micro USB port. A separate model compatible with the iPad mini is also available in Apple Stores starting Tuesday. It, too, is priced at $99.95. Gamevice is also working on another $100 model designed for the iPad Air, which it says is "coming soon." 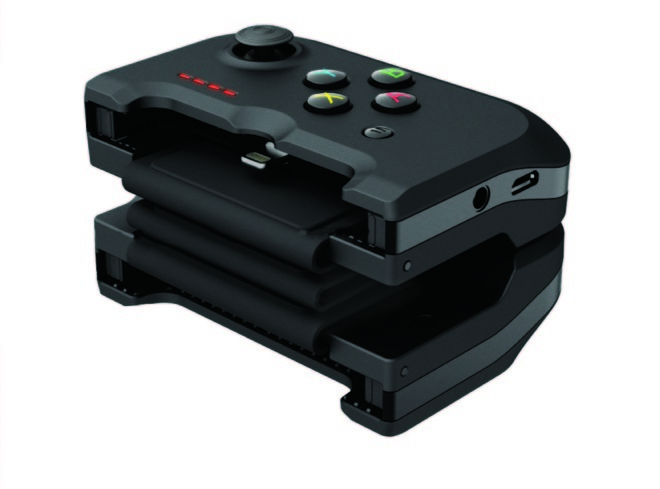 The Gamevice is unique because most recent controller accessories for iOS have opted for wireless Bluetooth connectivity, ensuring compatibility with future models boasting new designs. Some early Made for iPhone gaming controllers did attempt clamshell designs, most notably the Moga Ace Power designed for iPhone 5 and iPhone 5s. Even though controllers like the Gamevice are physically attached to an iPhone, they can also be used with external devices like an iPad, Apple TV or Mac thanks to a feature in iOS called Controller Forwarding. 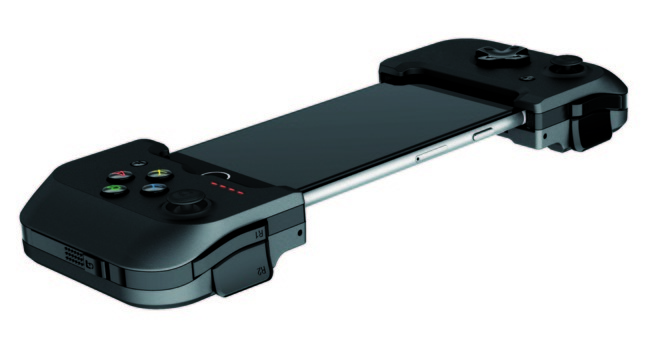 For more, see AppleInsider's extensive list of Made for iOS game controller reviews.